Do you talk on podcasts or in video? Want to be more comfortable in front of the microphone? To discover how to improve your spoken presence, I interview David Lawrence. In this episode I interview David H. Lawrence XVII, an actor and voice talent. You may know him as the evil Puppet Master in the Heroes TV show. David has also done extensive voice work for radio, movies and even as the voice for America Online’s customer service. David will explore how to find your spoken voice. You’ll discover tips to get comfortable speaking on-camera, as well as some of the more common mistakes people make when speaking. Listen as David H. Lawrence XVII shares insights on the spoken voice and how to become believable. You can also subscribe via iTunes, RSS, or Stitcher. How to subscribe on iPhone. David grew up in Cleveland, Ohio, listening to both local and nearby stations on a little transistor radio hidden under his pillow. “I just fell in love with the idea that one person can sit in a room and talk to millions of people and make each audience member feel as though he or she was the only one the person was talking to,” he recalls. Technology, David’s other passion, has also run through everything he has done. David recalls his first time on a commercial radio station at WNCI in Columbus, Ohio. At the very end of “Barracuda” by Heart, he came out with “Landshark, candy gram,” which was the big bit on Saturday Night Live at the time. From there he played the radio station jingle and headed into his career. After 12 or 13 years as a disk jockey, David’s radio station flipped format, and he moved over to talk radio, where he found his stride. From there he went into syndicated radio: SiriusXM. In 2007 David decided that “radio was great, it had its day and I was done with it.” It was time to move to on-camera. He says he likes the phrase, “Leap and the net will appear.” David just leapt, although he had been preparing and training. Before he did anything on-camera, he learned how the business worked, as well as who the gatekeepers (but not decision-makers) were. That knowledge was helpful when David first started to audition, he says. David booked Heroes within six months of starting the full-on audition process, which is a lot faster than a lot of actors experience with the process. David H. Lawrence XVII played the evil Puppet Master on Heroes. In addition to all of the legwork and preparation, David says the book, Secrets of Screen Acting (for which he recently finished voicing the audio book version), was also helpful. David also teaches voiceover courses on VO2gogo.com and he created the Rehearsal app. Here’s how the app came about. David was in his agent’s office and was called to audition across town with little time to prepare. His usual process is to record his lines and his partner’s lines. He would then put that recording on iTunes, so he could repeat it until he learned his lines. All he had at his agent’s office was his iPhone with voice memo, which did not have a repeat function. When David got to the studio, he learned they decided to write out the part. David set out to find an app that would do what he wanted it to do, should this situation ever present itself again. There wasn’t anything that worked the way professional actors work, so he teamed up with a developer (who happened to be a Heroes fan) and created one. 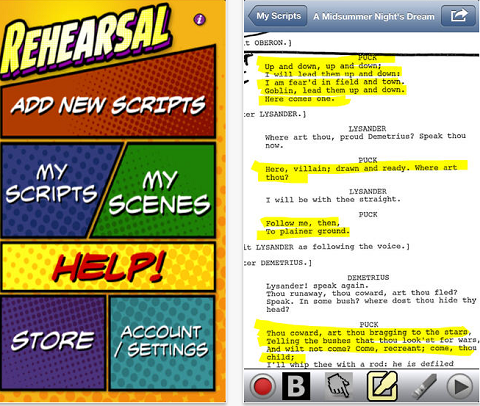 David created the Rehearsal app to help himself and other actors. 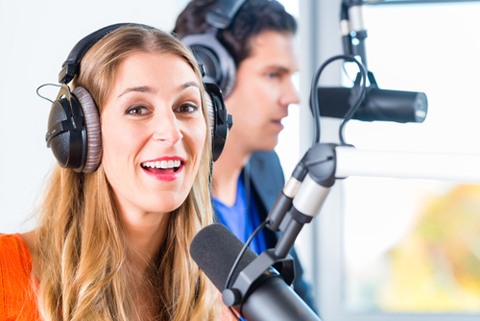 Listen to the show to learn more about David’s career path in radio. Your natural, authentic voice is the one you use during a conversation, David explains. It’s not the “broadcaster” voice that’s loud and announcer-y that people tend to use during podcasts. People need to be themselves. Be the person who is enjoying a meal, talking about something and enjoying life. That voice will be the most effective, authentic and profitable. Once you’ve found your voice, you need to listen to yourself. David warns, when you listen to yourself the first time, be ready to hate your voice. The reason is when you talk to someone, you hear your voice in two different ways at the same time. One is slightly behind the other, which is called being out of phase. You listen to your voice convectively. The voice that comes out of your mouth and through the air bounces off of the walls and furniture and back into your ear. At the same time, you listen conductively. This is through the bones and muscles of your neck, head and ear. Conductive sound travels slower than convective. It has a muffled, bass sound. If you cover your ears and talk, you only hear the conductive version of your voice. When you combine the two, that’s the voice you’re used to hearing. If you record yourself and play it back, you only hear the convective version of your voice, which sounds a lot tinnier. After a while, you’ll get used to it, especially when you’re speaking at the same time as listening. Wearing headphones while recording helps you monitor yourself. 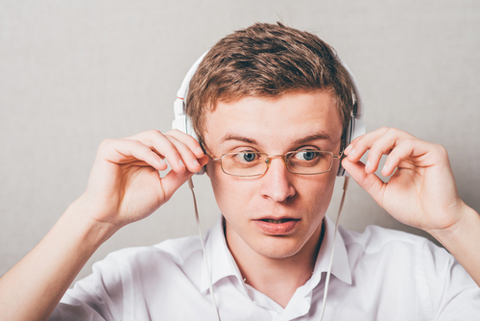 Working with headphones helps you learn to become comfortable with your voice. Image: Shutterstock. You need to get used to how you sound convectively, while not worrying about how you sound to other people, David continues. Find your actual voice, but also the voice that excites your passion. The voice you use every day (the way you speak, the way you present your words, the vocabulary you use, everything that you do on a normal, conversational level) is gold. Listen to the show to discover why David thinks vocal warmups are unnecessary. Some people need vocalized bridges (soooooo, ummm) as a moment to think, David explains. When you start to lose those, you become much more interesting. People are worried that if they don’t say something that keeps their place in the conversation, the other person will start looking over their shoulder for someone who is more interesting. The truth is, because almost everybody does this, when someone just pauses and inserts silence, rather than “ummm,” “like” and “you know,” the other person will lean forward. Developing that skill requires an active change in the way you speak. Some people, especially Millenials, use something called vocal fry. It’s the back of the throat speaking, which both men and women do. Kim Kardashian is probably the best-known person who speaks with that vocal fry. David finds that when people express themselves from a position of strength in vocabulary and presentation, as well as a natural sense of where the conversation is going, they are a lot better off. A strong, confident voice is your best asset. Image: Shutterstock. Listen to the show to hear what vocalized bridges and vocal fry sound like. David suggests never to read from a piece of paper or a screen. Instead, have bullet points or make a list of things you want to accomplish. When you’re interviewing, whether it’s for a podcast or you’re speaking to someone on a marketing video (like Jeff Walker’s Product Launch Formula), it’s an opportunity to speak extemporaneously or contemporaneously. Make people aware of your personality, as opposed to your ability to read words on a page. That’s when you become more available to the audience, because you can be more yourself. The idea that you’re able to just speak from the heart is both useful and terrifying. People don’t realize this very simple fact: You are enough. What you need is already inside you and will present itself at the moment you need it. Speaking about what you’re interested in is fascinating. For example, David shares how people who don’t understand tech listen to him because they’re engaged by the fact that he loves what he does. He’s incredibly enthusiastic, and people connect with him because he’s connected with what he’s talking about. Listen to the show to hear why reading off of a teleprompter distracts viewers. David suggests people stop looking at the interviewer and start looking at the camera. When people do video interviews, they usually look at the person interviewing them on their screen. Since you’re on-camera, look at the green light on your laptop (or the back plane behind it), and look at the other person out of the corner of your eye. That way your eyes are in perfect focus when people watch you. Focus your eyes on the camera, not on the person you’re speaking with. Image: Shutterstock. You can also cheat, he says. 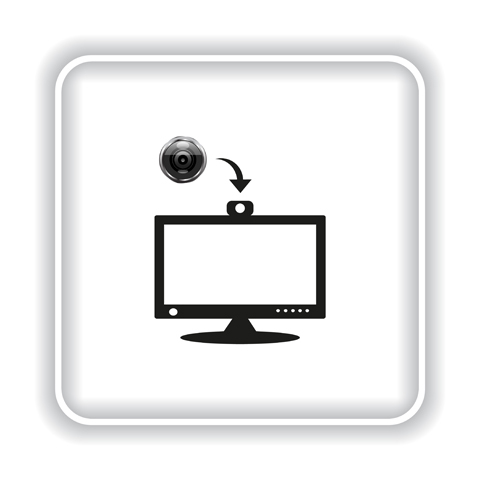 For example, if you’re recording on Skype and choose side by side rather than picture in picture, and the person being called knows he or she will be on the right-hand side of the screen, the person can look over to the right at you. Also, don’t keep your eyes on the camera the whole time. When people think about things that have occurred in the past, they often tend to look up and to the left. When people think about things in the future, they look up and to the right. Do these things, or close your eyes briefly when thinking about something or look upward. It appears much more natural. Acting classes don’t teach you the basic techniques of working with a camera. Knowing how to present yourself in front of the camera is huge for marketers. Listen to the show to discover how to use your hands when you’re on camera. You should never sell something you don’t believe in, David says. You’ll never come off as believable or authentic as someone who actually is into the product. David loves technology, as well as entertainment and performance (from both a working and consumption perspective), and the crossover between them. And it shows in his work. People say, find a niche and fill it. David expands on that. He says find a niche that makes you happy and makes you feel like you’re doing something for yourself and for others. Once you find something you’re passionate about, you won’t ever have to ask how to be believable, David explains. You’ll sound and look authentic because you are authentic. Listen to the show to hear what David says he should never try to sell. 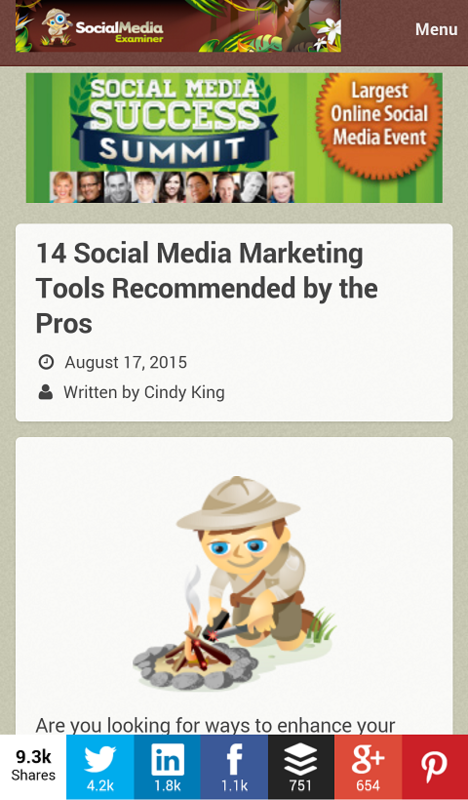 A lot of people have asked about the social sharing bar we use on Social Media Examiner and why we think it’s special. Like most social sharing bars, it shows the aggregate number of shares per article on Facebook, Twitter and all of the other major social networks. Plus, it displays the total number of shares at the very top. There are lots of tools out there that do this, but the one we use is called SumoMe. What’s special about this particular plugin for WordPress is that it’s mobile-optimized in a really cool way. On a desktop, the share bar floats at the side of the screen. On a mobile device, it appears at the bottom of the screen. On a mobile device, the SumoMe sharing bar is consistently at the bottom of the page. After I discovered this app and installed it, my friend Noah Kagen, who runs the app (and AppSumo), reached out to me. We began an email dialogue where I started offering suggestions. SumoMe is a free app, but there is pro (paid) version with some awesome features. The pro version provides UTM tracking (a Google function that allows you to add characters to the end of any particular URL so Google knows the source of the traffic), as well as some mobile-only plugins, such as WhatsApp and SMS messaging. Plus, the pro version is set up to only appear if you’re on a mobile device. The pro package is $20/month. Check it out at Sumo.com. Listen to the show to learn more and let us know how SumoMe works for you. Today’s show is sponsored by Social Media Success Summit 2015. 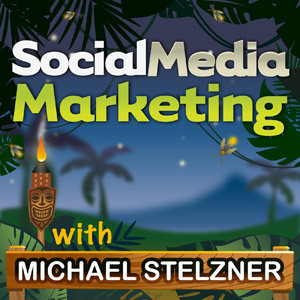 Want to improve your social media marketing? Need to prove your efforts are working? Join 4,000 fellow marketers at the online mega-conference, designed to inspire and empower you. Discover the best and newest ways to market your business on Facebook, LinkedIn, Twitter, Google+, YouTube, Instagram and Pinterest. Find new ways to improve your content and measure your results all from the comfort of your home or office. You’ll be led by dozens of top social media pros, including Mari Smith, Mark Schaefer, Amy Porterfield, Christopher Penn, Neal Schaffer, Ian Cleary, Viveka Von Rosen, Jon Loomer, Andrea Vahl, Steve Dotto, Amy Schmittauer, Peg Fitzpatrick, Brian Fanzo, Sue Zimmerman, Kim Garst, Andy Crestodina, Pam Moore, Martin Shervington, Ron Nash, Donna Moritz, Michael Stelzner and more. We have selectively recruited the top experts on every major social network to share tactical, step-by-step, hands-on information. Tim Schmoyer from Video Creators will talk about how to optimize your YouTube videos for search. This includes how to get people to discover your videos after you create them and publish them to YouTube, plus what types of things YouTube looks for that should be part of your content. He’ll go into all of this in depth. “This is my third year attending Social Media Success Summit and I cannot wait for October to get here. There is so much great information that you receive and no matter your social media marketing skill level, you get new information to use!” said Martie Rison. “I’ve attended just about every SMSS event and had the opportunity to go to SMMW earlier this year. I absolutely love Social Media Examiner and the high-quality content that is produced every day! Can’t wait to learn even more!” said Jason Goff. 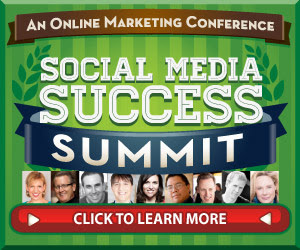 Social Media Success Summit is an online conference. It’s 36 different sessions spread across 4 weeks. There are three sessions per day, three times per week, over four weeks. And it’s on every conceivable social media platform you can imagine. Check it out. Visit SMSS15.com for significant early bird discounts. Learn more about David on IMDb or on his website. Check out the Rehearsal app on iTunes. Read or listen to Secrets of Screen Acting. Check out radio station WNCI in Columbus, Ohio and SiriusXM syndicated radio. Listen to “Barracuda” and watch the SNL Landshark sketch. Learn more about Jeff Walker’s Product Launch Formula. Learn more about the 2015 Social Media Success Summit. What do you think? 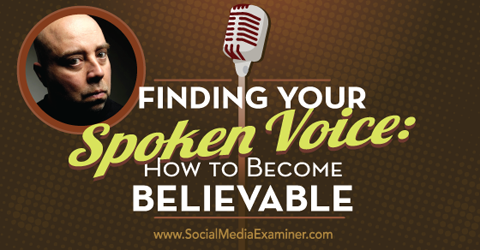 What are your thoughts on finding your spoken voice? Please leave your comments below. Headphones photo, Podcaster photo, Monitor camera photo from Shutterstock. 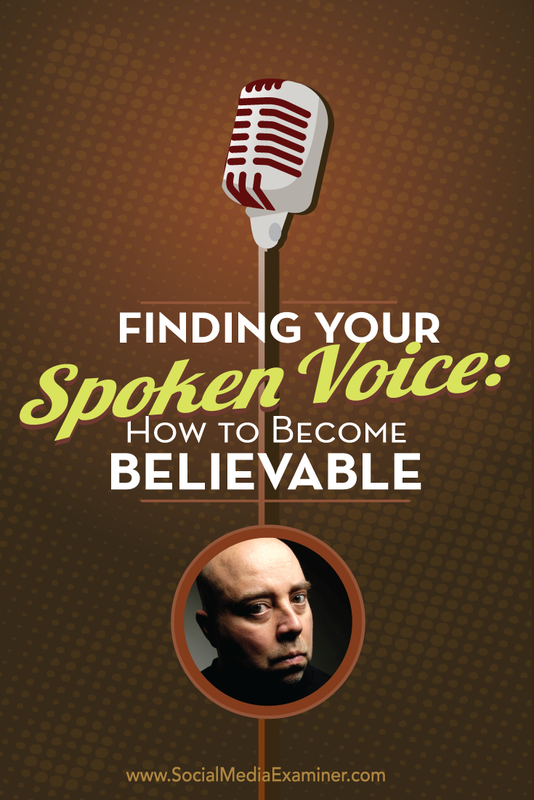 David H. Lawrence talks with Michael Stelzner about how to become believable with your spoken voice.